The chief operating officer of Oxygen Forensics, a Digital Forensics software company, says in regards to Drone Forensics. Lee Reiber, who has spent 15 years conducting digital forensic investigations, said the data that could be used was not limited to geo-positional data. “Not only positional, but also the direction of travel, rotor speeds, altitude, and many more types of telemetry,” he said in response to queries from iTWire. He said that what had started out as hobbyist enthusiasm – “and continues to create hysterical local stories of drones getting shot out of the sky” – had begun to have many practical uses and applications. “Private enterprise use of drones continues to expand, including using the devices for package delivery, sending vaccines to remote areas, and inspect factories,” Reiber said. He added that as public and recreational drone popularity increased, the devices presented a critical challenge for law enforcement, as witnessed in the Gatwick Airport incident late last year in the UK. The incident Reiber referred to occurred in December last year. Between 19 and 21 December, Gatwick, the UK’s second busiest airport, was forced to cancel hundreds of flights after reports of drone sightings close to the runway surfaced. There were major disruptions which affected about 140,000 passengers and 1000 flights, according to Wikipedia. Reiber said drones could pose a serious risk to public safety, privacy, and security. 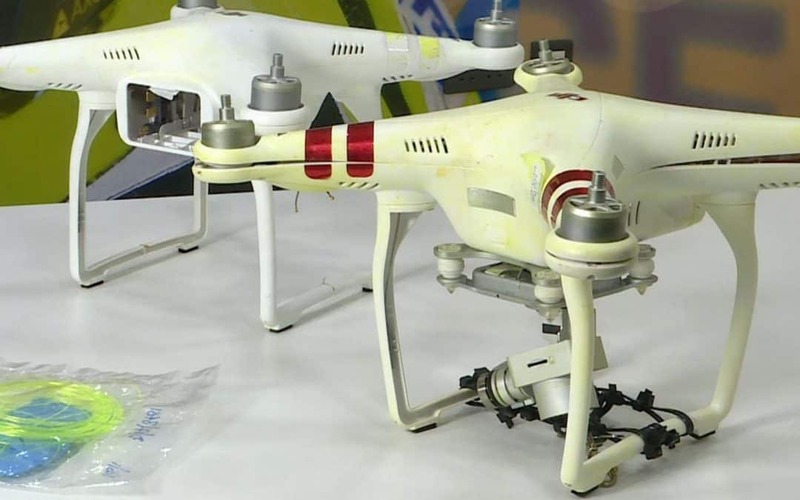 “Beyond the threat of flying into protected airspace, the devices can also be used to commit crimes like transporting drugs, carrying explosives and finding targets to burglarise,” he said. When iTWire pointed him to the system developed by Israel-based ParaZero — a system known as SafeAir which is attached to the top of the drone and uses various parameters to judge what should be done while the drone is in flight, bringing it safely to earth iof the need arose — he said this was no guarantee of safety. “The drone’s firmware can be hacked in as little as 30 seconds with flashed firmware,” said Reiber. “This would make the drone invisible to any type of countermeasures (radio jamming, command, and control, etc). Asked whether a ban on use of drones in some industries was the solution, Reiber said there would be no ban on commercial drone usage. “The oversight should really be on the purchasing of both recreational as well as commercial drones,” he said. “There currently is a requirement by the FAA to license each drone and register. “But, much like the requirement to license a firearm in each US state, this can often not be followed. Many countries, like India, ban all drones except for law enforcement usage. This was really done before recreational drones were easily available. Many other countries have very stringent laws on flying UAS, like the UK. Reiber said there were both pros and cons to the use of drones. On the positive side, he listed law enforcement usage for safety (EOD, SWAT, Patrol, etc), “where a drone can make sure the scene is safe before sending in human assets”. Oxygen Forensics provides law enforcement and government with quicker access to more critical information from drone data.